Our mission is to provide camaraderie, support, information and service. We have several social media sites and a newsletter that provide information about the how we handle the exciting, crazy and stressful lives that we lead. We share our triumphs and mourn our losses, ask for advice, give moving, childrearing and recipe tips and support one another in good times and bad. We have a mentoring program that pairs up newer wives with one who is seasoned. Advice is shared, friendships bloom and someone who really gets it is just a call, text or email away. Whether you are a new wife who has questions and are seeking support or a seasoned wife who has advice to share and needs camaraderie we are your group! Come laugh, share stories, gain and share knowledge, hug, and leave feeling ready to face whatever comes next. Our annual convention, which takes place during the AFCA convention, is a time of educational programs, a time of coming together and meeting up with friends from previous staffs and making new ones. This annual coming together of wives from all levels of coaching is a time where we recharge our batteries between the busy season and recruiting or between various sports. We also take time to provide service to a local hospital and award scholarships to coaches wives who are working on their education. Yes No If yes, our director of sponsorships will be in contact with you soon. Thank you! Note: At the end of this form, when you click the submit button, you will be redirected to PayPal. Don’t have a PayPal account? That’s okay! PayPal accepts credit card payments. 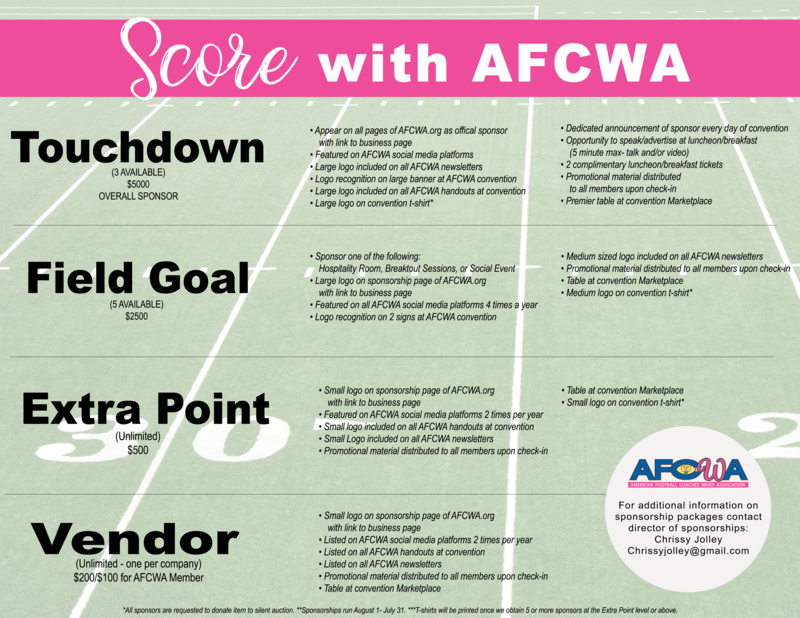 Stay connected with AFCWA. Follow us on social media! We'd love to connect with you on social media! If you'd like, share with us your social media contact(s).